Last weekend, for the second time in 16 days, my youngest child managed to run a fever, thereby ensuring 1) a low key weekend, and 2) no school on Monday. Since Monday, she has spent about 1.75 days at school, as apparently this particular virus has a very long recovery time (which would explain my lingering fug as well...). So I've spent most of the week, cuddled up with Boo and the Wee Dog on the couch, watching 101 Dalmatians (the Glenn Close version - so fabulous!) over and over and over and over and...and spinning. Lots and lots of spinning. 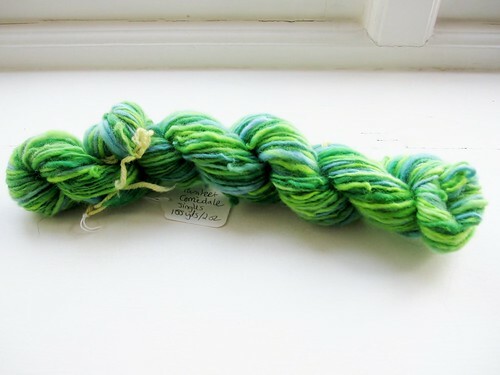 First up: you've seen this yarn before, but now it's had a bath and I have stats. 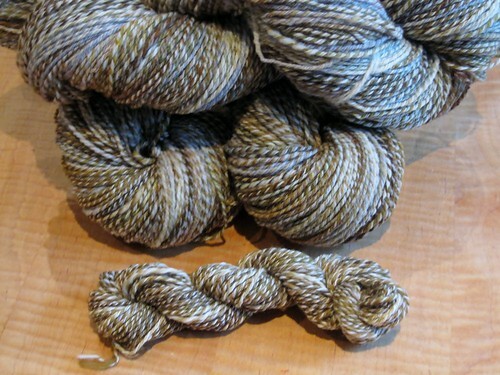 Dirty Porridge Portuguese Merino/Targhee combo (from Silt PM and Parritch Targhee, Hello Yarn Fiber Club offerings), 3-ply, 1210 yds/20.3 oz (plus 38 yds in the mini skein for swatching), 10-14 wpi, 947/925/990 ypp for the three big skeins. So approximately aran weight. Destined for a big, squooshy, wraparound sweater for me, me, me. 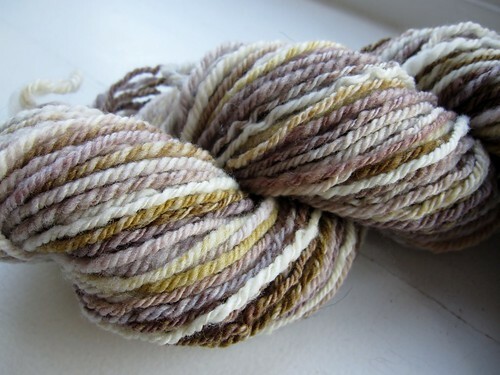 This week, I managed to ply up the leftover singles from each colorway. 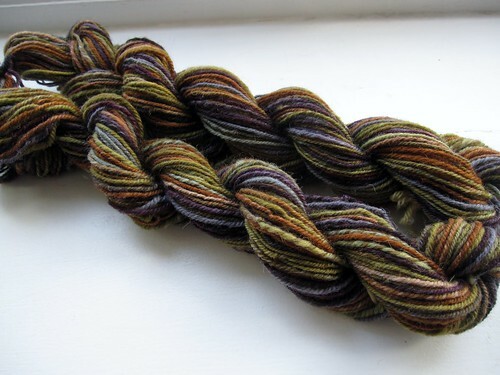 My most recently finished spin for the week (i.e. still drying!) 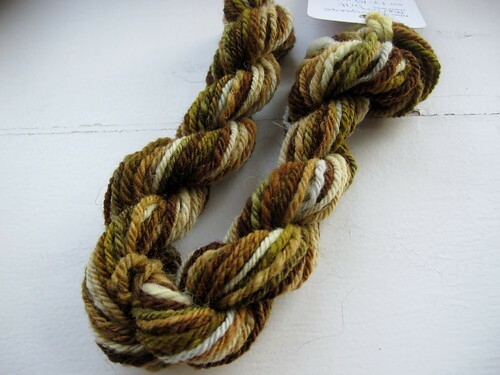 is also from Adrian at Hello Yarn: Gobbler Cheviot. I started this on the miniSpinner at spinning night on Tuesday, finished the singles while home with Boo on Wednesday afternoon, and chain plied (for the first time on the miniSpinner) last night while watching Game of Thrones season 1. 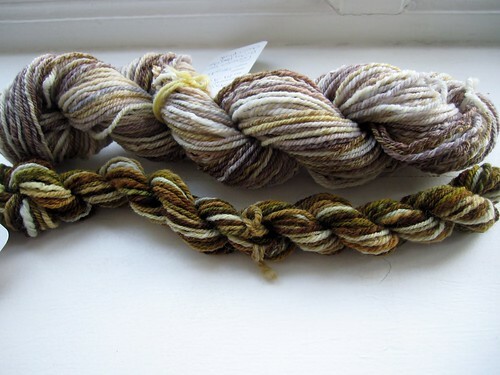 I want matchy-matchy socks from this fiber, so I split the top in quarters lengthwise and spun two pieces end to end, added a bit of waste yarn in the middle to mark the split between the two skeins, then spun the other two pieces. I also tried chain plying on the miniSpinner, which I hadn't done before, and it went pretty well, once I figured out the right speed to set. Final yardage is 95 yds and 130 yds, so either I split very, very poorly or I'm going to need two different needle sizes for each of the intended socks. Hmmm. I love the colors though, and my goal is to finish the socks by our next spinning night a month from now. Initially I intended them for me, but I suspect Himself might decide these need to be his....good thing his birthday is next month! I ended up with 100 yds/2 oz (800 ypp, about worsted weight), with only a few spots of overtwisting and no breaking when skeining - result! I was hoping for a bit more yardage so I could whip up another singles hat for myself, but this may end up as a kid-sized version. Finally: the fastest sweater lot (I hope!) ever. 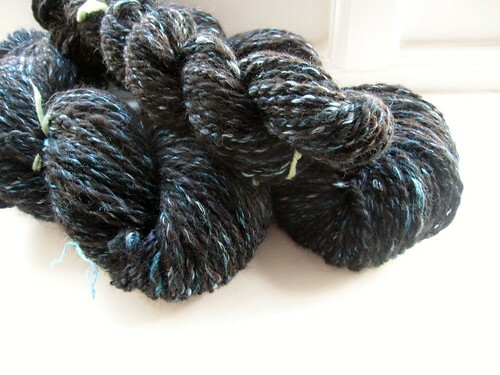 This is a pile of Magpie Shetland-silk that I've spun up for a sweater for barter as part of mine and Alli's SSP*. Started the singles on Sunday afternoon. Finished singles Monday morning. Finished plying Tuesday night. Finished yarn by Wednesday. 480 yds/16 oz, 8-5 wpi, 480 ypp, super bulky (At least in my eyes. In fact, it's so bulky I'm not sure I have needles big enough to get a nice fabric!). I spun the singles on the Lendrum at 12:1, doing a backwards draw to keep them light and airy (and superfast to spin). In essence, I let some twist into the drafting zone and pulled backwards against it - kind of a long draw, sort of, maybe**. I plied it on the miniSpinner trying to keep the plying twist low to maximize the yardage. We will see if I have enough once I swatch and do some number crunching! And...I think that's it for me. One week, 705 yds of yarn from scratch, 157 yds of newly-plied, and 1348 yds of newly finished and measured yarn. Which makes a total of far too many 2210 yds of finished yarn for the week. Basta! No more spinning for me for a while - with all this fresh new yarn around, I've got to get knitting! ** I can hear the screams of the true long draw spinners from here. Sorry! 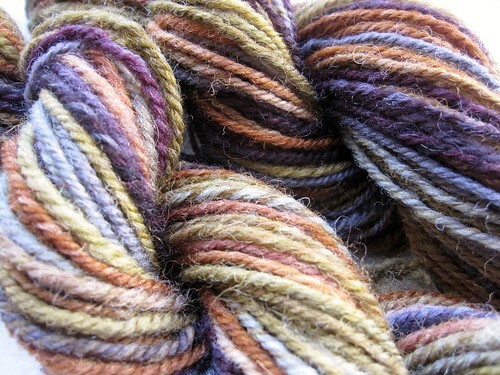 Written by porpoise On February 8, 2013 In "fiber club", "spinning", "stash"